(PhysOrg.com) -- The International Research Institute for Climate and Society based at Columbia's Lamont-Doherty campus issued its forecast for an "active to extremely active" June to November hurricane season in the Atlantic region this year, raising concerns about how major storms could complicate efforts to clean up the BP oil spill in the Gulf of Mexico. Experts are concerned about how high-speed winds and changing ocean currents might affect the spill. According to the National Oceanic and Atmospheric Administration, a hurricane passing west of the slick could drive the oil toward U.S. coastal areas, while one passing east could drive it further out to sea. NOAA is quick to caution, however, that many variables—the storm’s track, size and wind speed—would determine how a storm affects the oil spill. No one seems to know just how the spill would affect wave formations and water evaporation. 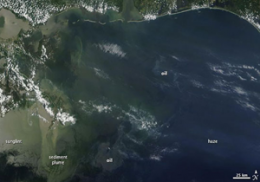 Evaporation from the sea surface fuels tropical storms and hurricanes. Theoretically, at least, an oil slick could suppress evaporation by keeping water from coming into contact with air. IRI experts say that this year’s forecast is due in part to the dissipation of the 2009-2010 El Niño and the increased likelihood for La Niña conditions, starting this fall. In general, La Niña conditions—cooler than usual ocean temperatures—increase the chances for hurricanes in the Atlantic, while El Niño conditions—warmer than usual ocean temperatures—tend to suppress them. The strongest influence on the hurricane forecast will be the surface waters of the Atlantic, says Suzana Camargo, a tropical cyclone expert at Lamont-Doherty who, along with IRI’s Tony Barnston, has developed and issued IRI’s seasonal hurricane forecasts since 2003. In April, surface temperatures in the Atlantic, where most hurricanes develop, rose to nearly 1.5 degrees Celsius above the 30-year average—a record, and the third consecutive month temperatures broke long-term records. “In general, hurricanes use warm-water temperatures as fuel to grow and get stronger,” Camargo says. Barnston, IRI’s chief forecaster, says these abnormally high sea surface temperatures, plus possible La Niña conditions, could lengthen the entire hurricane season. This is cause for concern for vulnerable countries such as Haiti, which is still rebuilding after the Jan. 12 earthquake. The IRI has helped develop a website focused on supplying government staff, relief workers and development agents in Haiti with up-to-date weather and climate forecasts. By making this information available through its ongoing partnerships with the United Nations Office for the Coordination of Humanitarian Affairs and the International Federation of Red Cross and Red Crescent Societies, the IRI hopes to alleviate some of the elevated storm risk for the country and ultimately help save lives this hurricane season.